April Showers brings spring flowers. Privydolls have to trek in the puddles as we strut around the city. 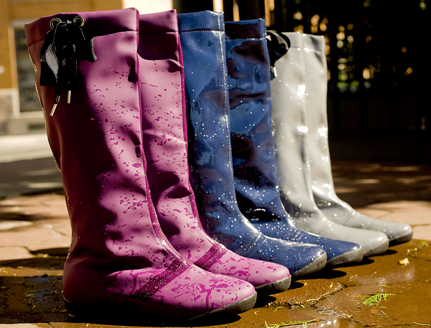 New rain boots by Scarpasa have made it easy for dolls to stay stylish and dry while waiting for summer to arrive. These are a chic alternative to the very utilitarian styled rain boots. These boots have a faux fur lining to keep feet warm, a drawstring from keeping rain coming into the boots, and made from a very flexible rubber that allow you to fold or slouch the footwear. 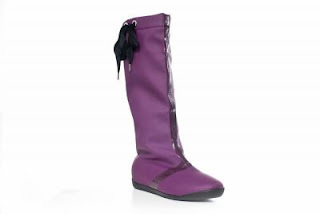 Scarpasa boots come in great colors such as purple, blue, matte black, shiny black and gray. Check out the website for more information or where to find these $135 must have spring boots to get you through the wet season. Those are some really cute boots. I love that they are not as stiff as traditional boots so there is flexibility when you walk. A drawstring top is so ingenious to help stay closed. I just wonder though are they going to keep feet a little too warm with the fur lining? Either way, they are really cute and if I did not already have 2 different pairs of rain boots these would definitely be worth a closer look.